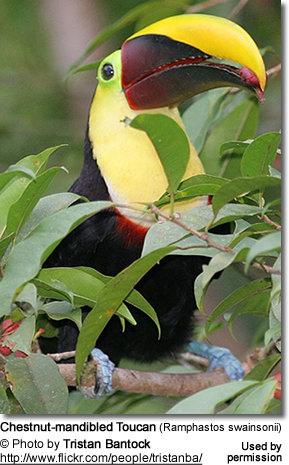 The active toucans require large, planted flights. Aracaris are generally docile and can be kept with smaller birds -- but not birds so small that they could be considered as prey by these large birds, such as finches. Breeding pairs are best kept alone. Captive birds may breed in nest boxes with a concave bottom; however, they generally prefer natural nests constructed from palm tree logs, which allows them to dig their nest chambers deeper. Their eggs are white andelliptical shaped. The young fledge when they are 40 to 42 days old. 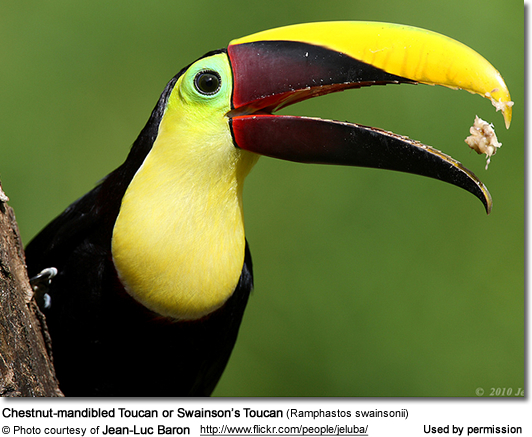 "Toucanets and Aracaris are far easier to breed than the large toucans and they are pretty close to being equal. I would rank them from easiest to more difficult as follows: Crimson Rump Toucanets, Guyana Toucanets, Green Aracaris, Emerald Toucanets, Ivory Bill Aracaris, Collared Aracaris, Curl Crested Aracaris, Chestnut Eared Aracaris, and Saffron Toucanets. I have other small species that have not bred at all, but I recently acquired them and only have a pair or two of each, so it is too early to know how they will do. The Chestnut Ears have been the greatest challenge because they scramble their eggs and thus you must pull them for artificial incubation as soon as they are laid. Then they are the most difficult to hand raise from day one. The Crimson Rumps, Guyanas and Greens are the easiest in that order I have never had mate aggression in the Curl Crested, Ivory Bill, Chestnut Ears or Crimson Rumps. 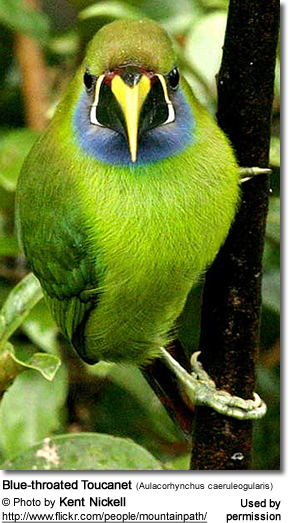 I have had mate aggression in Emeralds several times and once in Guyanas. They all require the same space. The smallest breeding flight I have used was 4' x 10' x 6 feet high and the flights I currently use are 8' x 12' x 8 feet high and the newest flights are 8' x 16' x 8 feet high. They need the proper diet, a nest log and the pairs must be compatible. I would start with the easiest, so when you have babies you will feel a sense of accomplishment and want to continue. If you start with a difficult species you will have much less luck and may become discouraged."